Quechua, Aymara an ither indigenous leids are co-offeecial in the auries whaur thay predominate. Peru is a kintra in wastren Sooth Americae. 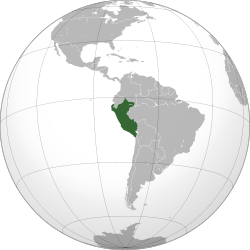 It is bordered on the north bi Ecuador an Colombie, on the east bi Brazil, on the sootheast bi Bolivie, on the sooth bi Chile, an on the wast bi the Paceefic Ocean. Peru is ane o the maist megadiverse kintras. Lima is the caipital ceety o the kintra. The Preses o Peru is Martín Vizcarra. ↑ "Ethnic groups of Perú". CIA Factbook. Retrieved 30 October 2013. ↑ Shugart, Matthew Søberg (September 2005). "Semi-Presidential Systems: Dual Executive and Mixed Authority Patterns" (PDF). Graduate School of International Relations and Pacific Studies. United States: University of California, San Diego. Archived frae the oreeginal (PDF) on 19 August 2008. Retrieved 31 August 2017. ↑ Shugart, Matthew Søberg (December 2005). "Semi-Presidential Systems: Dual Executive And Mixed Authority Patterns" (PDF). French Politics. Palgrave Macmillan UK. 3 (3): 323–351. doi:10.1057/palgrave.fp.8200087  . ISSN 1476-3427. OCLC 6895745903. Retrieved 31 August 2017. Only in Latin America have all new democracies retained a pure presidential form, except for Peru (president-parliamentary) and Bolivia (assembly-independent). ↑ 4.0 4.1 4.2 4.3 "Peru". International Monetary Fund. Wikimedia Commons haes media relatit tae Peru. This page wis last eeditit on 12 Mairch 2019, at 01:44.